Newspaper Extracts : March 1915. 3 March 1915, page 3. The Duke's full name is Duke Paoa Kahanamoku, and his age is 24 years. Standing over six feet in height, weighing 13 stone 21b stripped, he is a fine specimen of humanity. He is a full-bloodedled native of Hawaii and is consequently a subject of the United States. He speaks English well and despite his fame, is quite unassuming. In his own words, he cannot remember a time when he could not swim- and he is still improving. In 1911 he was unknown as a swimmer, but in that year he broke the world's record for 100 yards in Honolulu; his time was 55 2-5 seconds. In 1912 be made a trip to the States and as a result of his successes there, was slected to represent America in the Olympic Games at Stockholm. There he put up a world's record for the 100 metres - 62 2-5 seconds. He reduced this time to 61 1-5 seconds at Hamburg. Since then he has made three trips to the American west coast, durlng which he reduced his time for the 100 yards to 54 4-5 seconds. On November 30th 1914, he left Hawaii for Sydney where on January 2nd last he put up a world's record for the 100 yards of 53 4-5 seconds. He toured over Queensland and visited Sydney and Melbourne, breaking local records every time. His first public appearance in Wellington will be on March 6th. On a surf-board Kahanomoku is supreme. It is stated that in his native islands he has shot the distance of two miles upon one. In Sydney he had a special board made 8 feet long, 22 inches wide and three inches. It weighed 83Ibs, and on it he frequently travelled half a mile from out at sea to the beach. At Deewhy, near Manly, he has often taken a lady passenger on board and shoots hundreds of yards. He performs the same feat standing on his head. Wellington swimmers will probably have an opportunity of seeing Kahanamoku on a surf-board at Lyall Bay on the Sunday following his appearance in Te Aro baths. The Dukes companion, George Cunha, is a swimmer of no mean ability. He is an American of Portuguese extraction, aged twenty, and can do the hundred yards in 55 2-6sec. He is improving fast, and promises to develop into a champion. He is much smaller than the Duke, scaling 11 st 3lb. The third member of the party is the manager, Mr. Francis Evans, also a Hawaiian by birth. Volume LXXXIX, Issue 56, 8 March 1915, page 6. The people were well repaid. The visitor entertained them with a truly wonderful display of shooting the breakers, which, after the spell of southerly weather, were fairly large. His renowned standing shoot on the surf board was the particular feature. He stood right up on the board, while the latter shot along at a great speed. By careful steerlng he prolonged the shoot for a distance of 150 to 200 yards. Kahanampku and party spent a very pleasant time at the bay, the whole arrangements being in the hands of the Lyall Bay Surf Club. NZ Truth, 13 March 1915, Page 12. Duke Kahanamoku, George Cunha and Francis Evans, the great swimming trio, spent a glorious week end under the excelent supervision of Alec Ross, who placed his motor car at their disposal. All of Wellington's beauty spots including the bays, were visited, and altogether an enjoyable time was spent. Alec must have had his business eye open very wide. Maybe he was after some of the big Maori Chief's sumptuous supper at Lyall Bay. At any rate the way Alec piloted his guests back to town on Sunday night is suggestive enough that a real loverly time had been spent, and our generous motor friend had made good in the general round-up, and the lemon juice had put finishing touches to the great touring party. Tuesday 16 March 1915, page 6. AMUSEMENTS. Spencers are maintaining their reputation for high-class programmes. At the Princess Theatre the new bill presented last evening embraces some very fine subjects. The feature of them is the Spencer exclusive art film, "The Children of Captain Grant," adapted from Jules Verne's great story. It is 5000 feet in length, and is shown in seven parts. The story deals with an expedition which has associated with it many adventures, earthquakes, escapes from death, the taking of a child into the air by a condor, and other sensational events. It is a highly interesting production. "The Unknown Country" is another drama of much merit. It featured happenings of an entertaining and thrilling character. A war topical subject which is more than usually attractive is "With the Belgians in Action," while the picture "Bully Boy" depicts the No. 4 series of war cartoons which have been cleverly executed. The only humorous feature is "Biff! Bangl Wallop!" an amusing item. The "Australian Gazette" embraces the following topical subjects:- Sydney- Delfosse Badgery, the Australian aviator, does some most sensational flying at Victoria Park, including bomb-dropping. Melbourne- The state championship carnival; Duke Kahanamoku gives exhibitions on the surf board; and cartoons by Harry Julius, which form an entertainment by themselves. The new programme will be repeated this evening, and finally to morrow night. The Australian Gazette is full of interesting events, and is bound to be popular. The great swimmer Kahamanoka will also be seen at a surf carnival giving an exhibition on the surf board. Wednesday 17 March 1915, page 8. 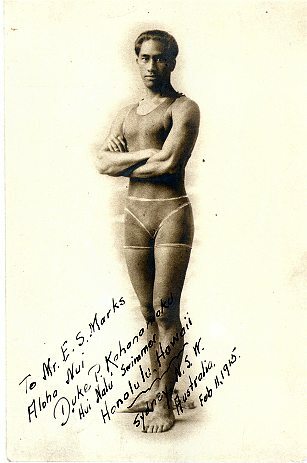 Duke Kahanamoku, the Hawaiian swimmer, has now placed every Australasian sprint record to his credit. By swimming the 50 yards course in Auckland last Saturday in 22 3-5s he has beaten the previous best performance for the world, held by Alec. Wickham, by a full second, which, in the short course named, is a remarkable achievement. He has also secured the 100yds world's best time, equalled his own world's record for 100 metres, and lowered the 150yds Australasian record. As these results have been obtained under varied conditions, they undoubtedly stamp him easily the world's best sprinter. Kahanamoku, Cunha, and Evans will compete at Auckland three times this week, and they will leave New Zealand on March 23 by the R.M.S. Niagara for Honolulu. The most important items in connection with the club programme on Saturday were the combined races of the East Sydney S.C. and Sydney Ladies' Club at Rushcutter Bay, and the Bondi v Randwick and Coogee Interclub contest at Coogee Aquarium. At the former, the two clubs named repeated their successes at earlier gatherings this season. The principal performer in the ladies' section was Miss Mina Wylie, who won both the championship and handicap over 100yds. At Coogee, Bondi triumphed over the Randwick and Coogee Club in the Mile Relay Race by a margin of 25yds, and thus recorded its sixth consecutive victory in this annual race. Manly Life Saving Club has again shown that it possesses the speediest swimmers in both the bath and surf. At Coogee Aquarium on Wednesday, Barry, Hay, and Wyld retained for the club the indoor relay championship over 300 yards by defeating Healy, Solomon, and Jones of North Steyne. Last Saturday at the Freshwater Club's Carnival the club won Mr. Arthur Griffith's trophy for the 1000 yards surf relay race. This was the second consecutive win. The race was won fairly easily, and as all the members are young, the prospect for future years seem very bright. Manly also gathered the senior and novice alarm reel races. The display given by T. Walker on a "Duke" surf board was very good indeed. The canoe and surf boat competitions provided some good exhibitions. The teams championship of the Northern Suburbs Club will be decided at the Mosman Club's members carnival at the Spit Baths, to-morrow evening. Manly team, comprising Solomon, Hay, Wyld, Huie, and Brown, seems invincible, and North Sydney and Mosman should have an even contest for second place. The 50yds junior championship of the district and an interclub handicap are also down for decision. The Parramatta Club will also hold a carnival at the local baths to-morrow evening, when a large number of prominent Sydney swimmers will compete. A council meeting of the A.S.A. will also be held to-morrow night. The carnival of the Sydney Ladies' Club will be held at Coogee Aquarium next Saturday, when the principal item will be the 150 yards ladies' championship of New South Wales. Last season Miss Mina Wylie established a record for this distance, which, however, was subsequently lowered by Miss Durack, and these two brilliant performers will again compete. In addition to several events for ladies, the East Sydney Club will decide the 440 yards champion of the eastern district, and also a club handicap. Next Saturday the Surf-Bathing Association of New South Wales will hold a carnival at Bondi Beach, to decide the final event in its premiership competition. Special facilities have been granted by the Waverley Council in the matter of reserves, etc. The nett proceeds will be given to the Belgian Relief Fund. The championship pennant will be contested by teams from Bondi, Cook's Hill (Newcastle), and Coogee. The programme also includes the usual surf races and rescues and beach sports. Friday 9 March 1923, page 4. Monday 19 March 1923, page 4. SUPERSTITION —AND A MUSIC LESSON. The weather was growing hotter and hotter. Up in the hills the white Christmas bush was flushing and ripening. Down on the beach the sand was too hot to walk on barefoot, and gave off a glare that was almost blinding. None of the Noah's Ark people bathed in the middle of the day, not wishing to have their skin stripped off by the sun, so I was able to get a good long morning surf myself, and even sent to Sydney for wood, made myself a seven- foot surf board, and, after many spills, succeeded in learning to ride it standing either on my feet or head and hands. But it's a lonely game surfing with no one to yell "Don't go down the mine, daddy," as one poises above the drop of a ten-foot wave, or to play that time-honoured game which never loses its flavour- i.e., to spot a wave with concealed dumping powers, to swim furiously towards it, yelling "All abroad," and then to hop neatly off it and watch the casualties. I found myself looking forward to the mornings when my late enemy, Andrew, the fisher lad, came along for an hour or so to swim with me. Little by little we were making friends, though he still disregarded my notices. I came to like him well in the end- him and his people, and once or twice I went down to their huts about 1 a.m., when they were all waking up, ate their rough breakfast with them, and went out in the darkness with the boats. It was an eerie sort of hour, depressing in the extreme with the whispering silence of the sea closing round the boats till one wanted to shout aloud- but didn't because the echoes would have been so beastly. I didn't wonder after the first night that fishermen were superstitious and quite realised how the legend that the Day of Judgment was close at hand must have spread among the North of Scotland fishing boats. daylight were coming up out of the sea- something big and terrible like the horsemen of the Apocalypse or the dragon with seven heads and 10 horns. Andrew's old father knew the Book of Revelations backwards, and I always remember how one hot windless dawn he stood up suddenly in the boat and said loudly: "A sea of glass mingled with fire" and sat as suddenly down again. Which was just what it was- I've never seen anything like that sea before or since.